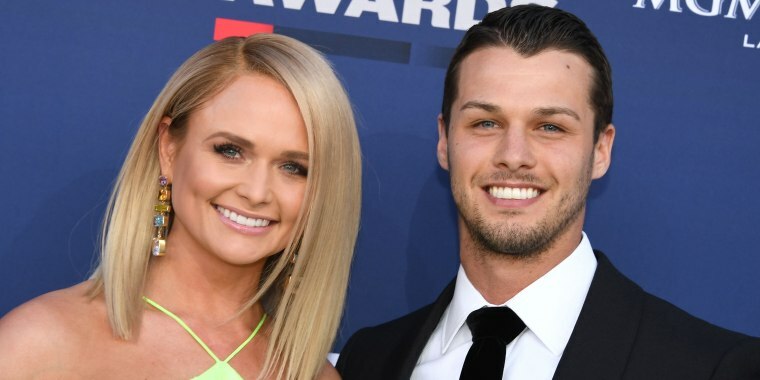 It's been a little more than two months since Miranda Lambert and Brendan McLoughlin said their "I dos" in a secret ceremony, and now the newlyweds have taken their relationship one step further — all the way to the red carpet. On Sunday, the duo stepped out and made their public debut at the 2019 Academy of Country Music Awards. The "Little Red Wagon" singer, who wore a neon-green halter dress, and her NYPD officer hubby, who was decked out in a streamlined black suit, sported matching smiles and as they posed for the cameras on one of country music's biggest nights. After the couple made their way inside the MGM Grand Garden Arena in Las Vegas, Lambert took the stage twice to perform at the event, but she didn't take the stage a third time to accept an award, as many expected. For the first time in a decade, the 35-year-old country queen didn't win the Female Vocalist of the Year award. That honor went to Kacey Musgraves, who's still riding high from her trio of Grammy wins in February. But the break in her record-setting win streak didn't seem to dampen Lambert's spirits Sunday night. Whenever the camera cut to her and her 27-year-old partner, their smiles remained firmly in place. And if this post-show clip she shared on social media is any indication, her good mood continued after the glitz and glam-filled event came to an end. Lambert and McLoughlin's first public appearance together was sure to please fans of the singer who've been eager to get a glimpse of the couple side-by-side ever since Lambert announced their union seven weeks ago. Two days after Valentine's Day, the hit maker, who'd kept her relationship with McLoughlin a secret until that point, revealed the pair had tied the knot by sharing wedding photos on social media and writing, "I met the love of my life. And we got hitched!" The ceremony, which took place in January, came five months after Lambert broke up with Turnpike Troubadour's frontman Evan Felker and nine months after her split from southern soul singer Anderson East. Her wedding to McLoughlin marks her second time down the aisle. She and singer-songwriter Blake Shelton, who were once considered country music's it-couple, divorced in 2015 after four years of marriage.